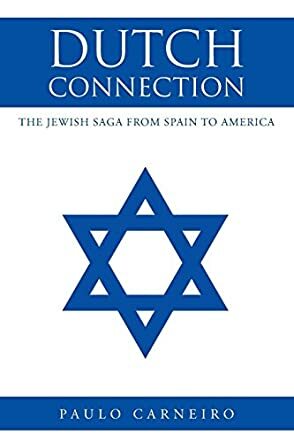 Dutch Connection: The Jewish Saga From Spain to America by Paulo Carneiro is a historical book that chronicles the saga of the Jews moving from Spain to America. This is a tale of resilience beginning with the ousting of the Jews from Spain in 1492 by Ferdinand of Aragon and Isabella of Castile, resulting in a movement of many of the expelled Jews to Portugal where another grim fate awaited them. King Juan II masterminded the deportation of 2000 Jewish children to the colony of Santo Tomé in Africa. The Jewish people would suffer being forced to become Christians and submitted to the brunt of the Inquisition. Follow this story of how the Jews became indispensable in the sugar war, giving the Dutch a victory over Portugal in Brazil, how they founded the Recife Community under Dutch rule, and how they founded their first synagogue. But after twenty-four years of Dutch occupation, the Portuguese returned in 1654. It was then that the Jews had to leave, and at that time twenty-three Jewish refugees fled to the Colony of New Amsterdam, now New York, and became the nucleus of the first US community. Dutch Connection: The Jewish Saga From Spain to America is the history of a people who have been utterly abused, used, and trampled upon, a tale of resistance and resilience, as poignant as any can be and as inspiring. Rebecca Pearce did an impeccable job with the translation, rendering the text crisp and comprehensible. The reader is left in no doubt that Paulo Carneiro did great research to bring this part of Jewish history to readers. It is gripping, hugely informative, and entertaining. A history book that reads like fiction.